Merimbula Sailboard Club members welcome you to the 39th Merimbula Classic. The Merimbula Classic is a SUP-Kite-Windsurf event like no other. Its a 4-day celebration of wave sailing, SUP surfing and kite surfing in the wind and waves of The Sapphire Coast. There’s no heats, no judging tent and certainly no coloured rashies. Just a long weekend of paddling, hanging out and having a good time. The Merimbula Classic has become much more than a surf event in 39 years. The four-day event at Merimbula’s Main Beach has grown to encompass so much on the water, but also food, music and lifestyle. Watch current and past world and Australian champions mix it with the locals on the beach, indulge in local oysters and produce at the now iconic “Taste of the Sapphire Coast” on Friday night and check out all the latest gear at Ford Oval, which lies just behind the dunes. This year’s event will be the 39th, making it the longest event of its kind in the world. The day starts with breakfast from the BBQ, the trade expo setting up from day break and friends catching up over coffee. 10:00am is the opening ceremony and registration. 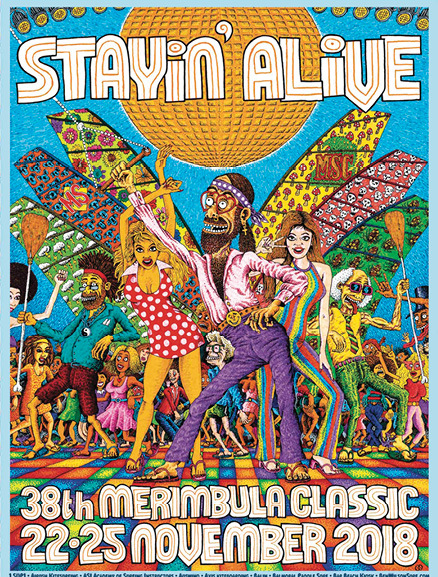 This is always very “Merimbula Classic” – a little weird, a little eccentric and a whole lot of fun. The rules are established – or rule – No Whingeing – and the event is opened. From there everyone hits the water for a full day of wind and waves. This is followed by a few beers at the beach tent in the afternoon, lots of stories and catching up with friends both new and old. This may or may not end up morphing into a night of drinks, laughs, pool and darts at the Lakeside Pub, just across the bridge from the event. The Surf Sup crew are always on it early, from day break at the main beach, the Bar and Pambula. The kite and windsurfers more on the coffee and breakfast mission, getting ready for a long day on the water! 10am is the daily briefing and the BBQ is running hot. As the wind kicks in the Sups are replaced by Kites and wave sailors. As any waterman should know, picking the right conditions can make or break a good session. The Merimbula classic understands this and do a great job when choosing the times to hold the Bar to Beach and the Battle of the Paddle SUP races. Usually held mid-morning on Friday or Saturday, the SUP racers prove themselves in two relay style events. A standard Battle of the Paddle relay event is held in and out of the surf in front of the event site. As well as the Balmoral Paddle Surf Beach to Bar team relay. SUP racers start at the bridge on the inside of the Fishpen, through the flatwater to the pass, onto the beach and up to the Bar Beach Kiosk for a shot of coffee, back on the water through the surf and finishing in front of the event site. It is definitely the most fun, competitive and entertaining activity for the spectators and the SUP competitors. The afternoon drinks run into the annual “Taste of the Sapphire Coast” which boasts the Sapphire Coasts best food vendors, live music and loads of laughs. For those still keen for a little partying there is usually a walk-up town to Dulchie’s, possibly the coolest little bar in town. Saturday starts in a similar way to Friday. The committed are already on the water at dawn… Surfing, SUPing and Foiling. Meanwhile the kiters that haven’t joined them are enjoying the BBQ and hanging around while they tend to their hangovers. Keen for the wind to crank in, the first kiters and windsurfers usually hit the water mid-morning on their highly efficient foils. As the wind comes in throughout the day the foils are swapped for surfboards and the competition zone becomes flooded with kites, sails and Sups all sharing what the ocean has to offer. Saturday evening is often the highlight of the event. This year’s theme comes to life as the dress up costumes everyone has been planning for the last 12 months come out. Dinner and a few drinks at the Merimbula Bowls Club turns into a few more drinks… and a few more drinks in the back-room while enjoying the music of the Figmentz playing live. Those who didn’t dress up stick out like a sore thumb and those who did have one of the best nights of the year. Sunday morning is normally the quietest morning. Everyone is a little slow from the big night. This however does not stop the super frothers from getting out in the surf early while the wind is offshore. the last day of competing is quite often the most crucial as everyone tries their hardest to make the best final impression on the water. By Sunday afternoon everyone is shattered from long days on the water, long nights with friends and ready to sleep for the following week. A mellow night is had as dinner is served at the awards ceremony. The number of prizes that are on offer is usually breathtaking to those who are new. In a Merimbula Spirit, everyone goes home with a prize! During the four days all the latest in water sports equipment and accessories will be on display at the event site – Ford Park, so check out what’s new for the summer. This is the biggest expo of SUP, Kite, Sailboard and Foil gear in Australia. Pretty much every brand is represented with trade stands and demo gear, team riders to help and chat to, and a really cool “try it out” vibe. There is so much gear to try, right on the main beach and ready for you to get out there and experiencing the latest and greatest from all the brands. This is an opportunity for sponsors to showcase their wares at the beginning of summer mid-way between Australia’s population centres. No event parties like the Merimbula Classic!